Wow does time fly! I last blogged on December 6 and SO much has happened here at CFC as well as personally. Let me bring you up to date. I took off December 7 to Puerto Vallarta. It was the year of the adult trip. We travel with a group of friends and we alternate between adults only and a family vacation. Our group loves to go to Mexico to enjoy the warm tropical weather in the middle of winter. The weather was PERFECT and we enjoyed a fantastic excursion, the Extreme Zipline tour. This was the tour that kept on going. A 30-minute boat ride, a 20-minute truck ride, a 30-minute mule ride. Nine great zips across ravines and through the forest. Two rappels, one of which was next to a 55-foot waterfall. Two water slides. 20-minute truck ride back to the bay. 30 minute boat ride which included a stop at Los Arcos.A whale spotting.What a great day, such wonderful memories with magnificent friends. A side note, I did not love traveling in the middle of the holiday season. I truly enjoy the holiday parties, the baking, the chaos, the shopping and felt shorted of my precious holiday season. While we were in Puerto Vallarta, my daughter, Maddi was officially accepted to North Park University in Chicago. She waited for our return to tell us. She is planning to play fast-pitch softball there. We are in the midst of planning a huge graduation party with three of her close friends and she leaves for London tomorrow for a trip with the English department at her school. This week will give us a peek of what our life will be like this fall as empty-nesters. We completely closed the office the week of Christmas and undertook a facelift/remodel of the office. We replaced floors, painted walls, added electrical, lighting and redesigned one of the office. What a huge undertaking! We packed EVERYTHING in a day. We were able to purge so much as we moved back in. After the New Year, we played catch up, move in while enduring the little glitches that happen with technology. It was tough but well worth it, the space is better utilized and we are not on top of each other. It has taken some time to even talk about it. We were blessed with such an amazing football season then then we were blindsided while watching the Super Bowl. I still think the city of Denver is still recovering. No one talks about it. In the rare occasion the Super Bowl is mentioned, it hurts to the core. 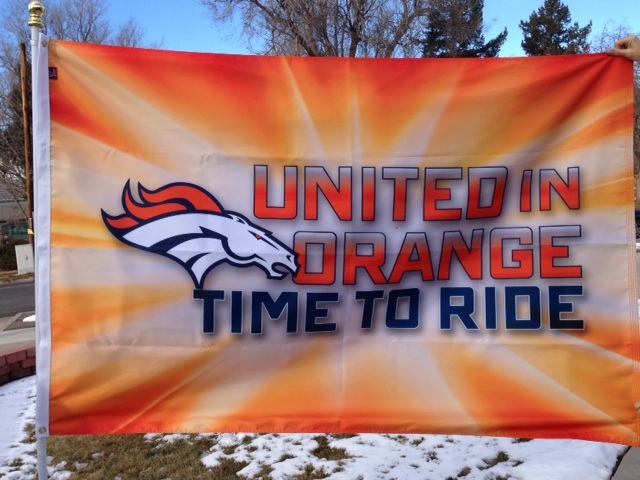 We enjoyed a rush of customers wanting to get their Denver Bronco flags as well as working with the Denver Broncos to produce their UNITED in ORANGE, Time to Ride flags. We have had the opportunity to expand our staff this winter. David and Zach have shifted from part-time to full-time. David is splitting his time as a service tech working in the office He has taken the reigns running our new heat press.He is a great leader and well as gifted in graphic art and is amazing working on custom jobs. Zach has taken on the responsibility as the Lead Tech. His organization and thoroughness are a huge assist to our service department. Denise is our new administrative assistant; she is responsible for account receivables, inventory management and customer service. 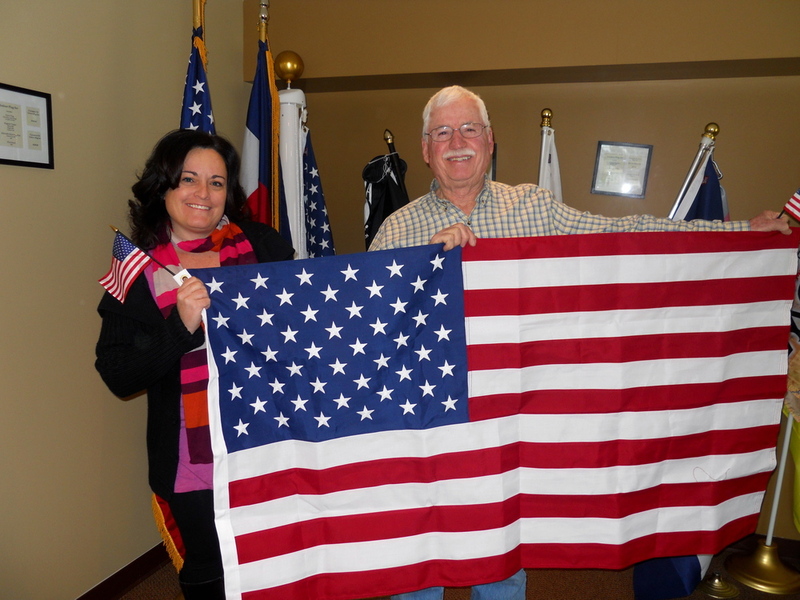 This past fall I was elected to the NIFDA (National Independent Flag Dealers Association) Board of Directors. It is an honor to serve on a board for an Association that has truly helped me and my business. I have the opportunity to work with like-minded professionals who do exactly what I do. I traveled to San Antonio in February to attend our annual face-to-face meeting to lay out our plans for the upcoming year and begin planning the NIFDA convention. The single, most important, announcement of the past few months is my father, Phil Millett, has officially decided to retire. We started this business in 1998 as equal business partners. We started small, just the two of us.We have grown and expanded to over 10 employees and he is ready to enjoy retirement full-time. Our day-to-day operations will be unchanged with the amazing staff we have in place. I was surprised by the emotion this move has brought and I have been honored to work with my dad for over 15 years. I have truly LOVED our business relationship. He is the sweetest, most genuine person I know. I’m going to miss you POPS! 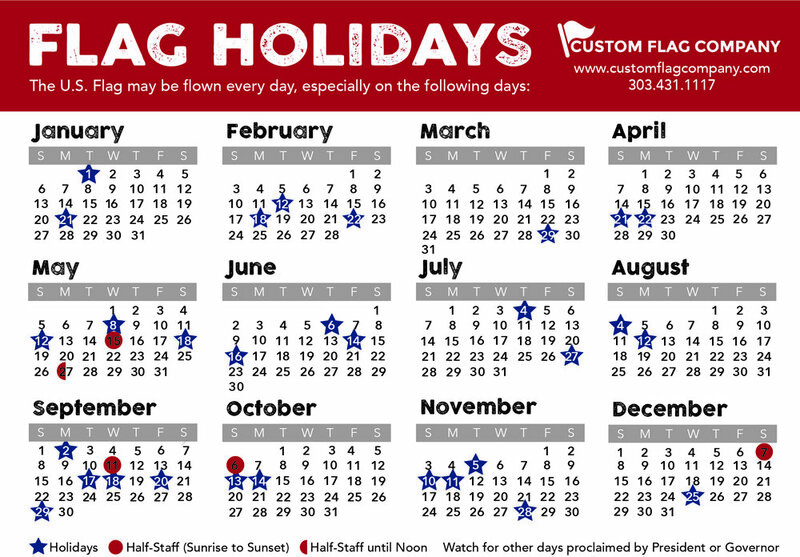 Posted on March 21, 2014 by Kim Griebling and filed under CFC Staff, Custom Flag Company News, NIFDA, Uncategorized and tagged Custom Flag Co- Custom Flag Happenings.